Having a hard time finding an affordable carpet installation in Roseville? 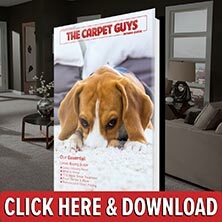 End your search with The Carpet Guys, one of the best carpet installation companies in the area. With our professional installations combined with our great carpet prices, you cannot go wrong. To accommodate each customer's schedule, we offer free in-home installation estimates and appointments every day of the week. Next day installations may be a possibility on our in stock products. Amazing carpet prices on the material and the installation. We are a family owned, shop at home carpet installation company. Furniture is moved out of the selected room(s) and placed back into the original layout after installation free of charge. Upon scheduling the in-home estimate, samples with be brought to your home by a friendly sales representative. After the carpeting material is chosen, the appointment is scheduled. Upon the arrival of the installers, the furniture will be moved out of the rooms. The old carpeting is then ripped up off the floor and neatly bundled up. It is then placed outside for garbage pick up. The floor is prepared and the padding is laid out. The carpeting is rolled on top of the pad and installed. The furniture can then be moved back into the original placement. Whatever your Roseville carpet needs may be, contact The Carpet Guys to take care of them. Do not worry about the stresses and anxieties of carpet shopping or carpet installation. We take that way from you. To get started, fill out a free in-home estimate via our website or call in to speak with one of our friendly representatives and find the carpet prices you are looking for.